If you’re anything like me the thoughts of producing a distribution map to illustrate a report or to test a new idea will fill you with dread at the thought of the hours of tedious work involved. I’ve often wished that someone would produce a software package that would make the whole task easier. 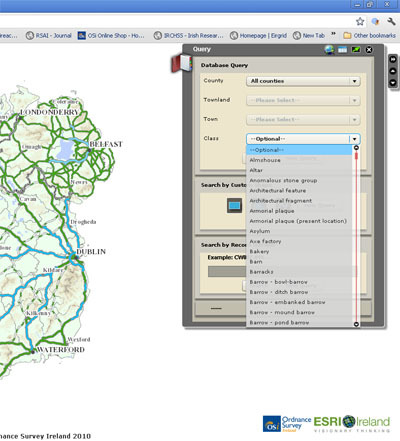 Now the National Monuments Service has come to the rescue with the new National Monuments Database Map Viewer which is available at http://www.archaeology.ie/. The Map Viewer can be used to create distribution maps of any monument site classification as long as there are less than 999 records and you don’t need a degree in a computer programming language to do it. 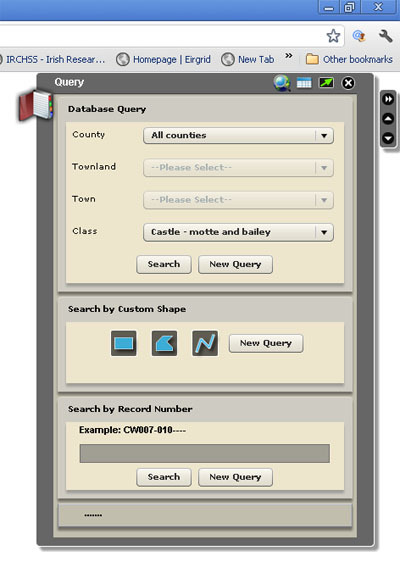 The trick is in the use of the new database Query window that sites at the top right of the new Database screen. 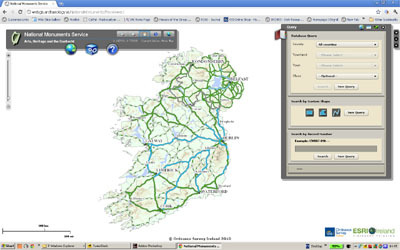 Maps can be created on a national level or a smaller area such as a county or townland can be selected by choosing a county, townland or town from one of the the drop-down menus in the query window. Selection of Motte and Bailey Castles. Once the area is chosen, go to the class drop-down menu and select the type of monument you want to map. In the example illustrated here I’ve selected Castle-motte and bailey because there are fewer than 999 of them. If you want to map a class like Ringfort with thousands of examples you’ll have to work at the county or townland level. Click search and it generates the map. 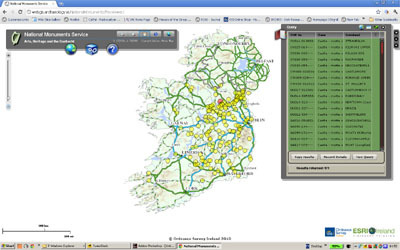 Now simply click the search button and the Map Viewer automatically generates the distribution map for you on screen. Above is the distribution map of Motte and Bailey Castles! 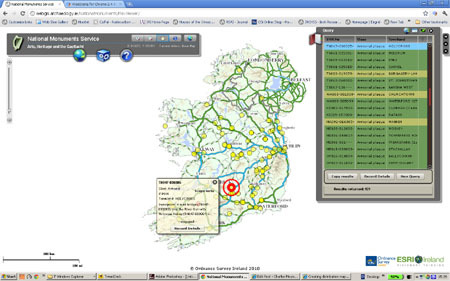 Hover over a distribution point to get its details. [/captionIf you hover over the distribution point with the cursor it will bring up a window with information on the site and highlight the site on the dropdown list in the query window, great. Currently there’s no way to output the distribution map to a printer or graphics package so you’ll have to resort to the trusty screen grab. All in all this is a huge leap forward in the ability to use the data held in the National Monuments Database. Thanks are due to everyone involved in making this available, especially Paul Walsh. This entry was posted in Archaeology and tagged Archaeology, Database Viewer, distribution map, Motte and Bailey Castle, National Monuments by Charles Mount. Bookmark the permalink.